First generic advice you often get is to diversify your portfolio. Typically, Malaysians are encouraged to save in EPF, PRS, life insurance, and unit trusts. When you don’t know what you are doing, diversification is the most common strategy that makes sense. You don’t want to heavily rely on a specific asset class and put your money at risk. So you diversify. However, we seldom see people getting rich with EPF, life insurance or unit trust. The better guidance you should have is about how to get better result acquiring productive assets like good ROE stocks and high-rental-yielding properties. Second generic advice is to pay down your debt, especially your housing loan. That’s a common sense that might not work in your favour. Most home buyers take out EPF Account 2 to pay down loan principal. You could be tempted to put every year-end bonus to reduce your outstanding mortgage. In the hope to see the monthly mortgage commitment disappear from your budget, and you can finally call debt-free, you could be penny wise, pound foolish. This method works for your elder parents because the interest rate used to be >7%. It was as high as 13% at one point in history. But the past decade of low-interest rate environment has resulted in putting the savers on the losing end. Thirdly, you wish to see compound interest works its wonder. Here is where you might fall for illustration that double and triple your investment over a long period. Usually, projections of some insurance saving plans illustration look highly profitable because you are looking at the end figure. It looks good on paper. Especially for those who don’t understand the time value of money, any mediocre asset compounded at a low return rate will still look very impressive on paper. Take an RM10k fixed deposit compounded at 3% for 30 years, you will get about RM24k. It seems impressive for someone who doesn’t see the opportunity cost of a higher return rate. If you take the same figure compounded at 12%, the result is close to RM300k. That’s 12X more wealth! The fourth wishful thinking is hoping that your plan will work after 30 years. That posts a big problem. What if it doesn’t work? What if this retirement plan doesn’t turn out to be what it is supposed to achieve? Then you had run out of time to “redo” the whole thing. For example, it happens during the 2008 subprime crisis, when many retirees’ net worth was wiped out due to the market crash. The problem is not the risk of stock volatility. It is the fact that you can’t redo a 30 years plan because you might not have another 30 years of energy and remaining life to do it again. Think again, how many decades can you live? By knowing the fallacy above, you want to ensure a plan that would work no matter what. So I would like you to realise that the missing financial advice you should get is how to invest in things that give you an immediate result, and can last as long as possible. When you have this new paradigm, you will know that spending on developing your skill, capability and self-improvement bear the best fruits. We spend the first two decades of our life to acquire skills. The person who does it right, see the tremendous result during adulthood and enjoy it during retirement. For example, if you have good people skill, you can be a great manager to climb the corporate ladder much faster. If you have superb communication skill, you can be a great marketer and sell tonnes of products, or pitch your ideas much more effectively. You reap the rewards in almost everything you do. Everything you touch has a chance to thrive and grow when you have the capability. As for entrepreneurs and business people, they make the best return investing the profit back into their companies. When you are running a business, you have controls over your people, your products, your cash flow, your system, your expansion plan, etc. Every dollar you plough back will give you a return that could be much better. So everytime when there are some investment schemes, ask yourself if you can get a better return investing in what you know and control instead? Take a paper and pen. Write down the investment options you have, including all that you have done, and all that you can do such as unit trust, your business, self-development courses, stocks, properties, etc. Assess how much return can you get from each. Sort the list according to the level of your knowledge, control, performance and risk. Focus on the top few options, and you will see your wealth grow at a much better rate. Then you can rest assured that your strategy to build wealth is focused, leveraged, compounded at the best return rate and course-correct frequently! 14 replies to "The Missing Piece in Your Financial Plan"
On the Falacy #2, in my case I need to settle my loan prior retirement which is 10 years from now. I took housing loan tenure of 15years. I plan to put what some portion of my extra incomes (ie from stock, bonus etc) to settle my Loan while I’m still earning. When you retire in 10 years time, can you use the incomes from stocks/investment to pay for the remaining mortgage commitment? Indeed this is best advice so far for this year. All of us has special skills for ourselves. For example an intelligent grab driver knows how to get 60% profit everyday by mastering their driving skills & looking for customer at the right place and at the right time. Thanks for the heads up,KC! Standing from a middle-class working adult point of view . 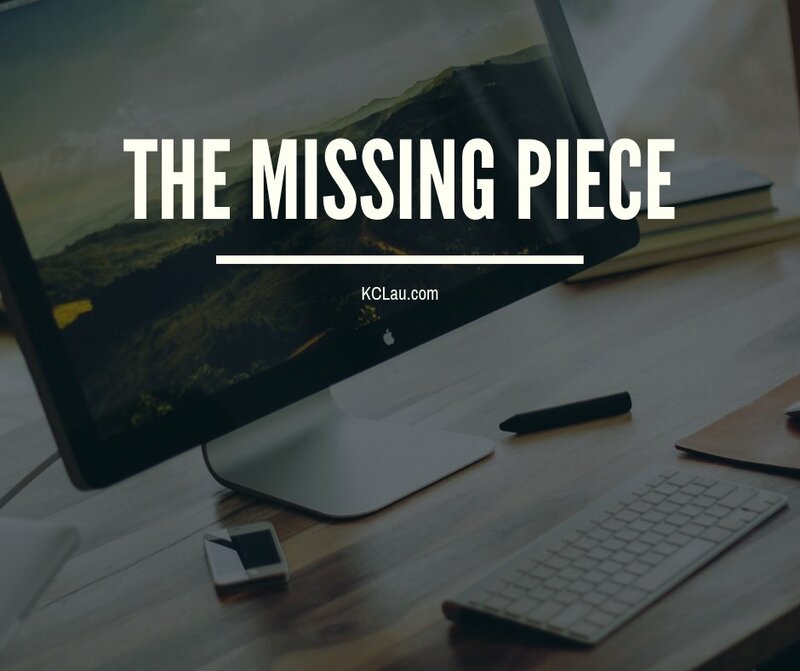 I think the ultimate “missing piece” to begin with is to have the basic financial knowledge FIRST and try to increase monthly income. 1. Stocks have higher risk than unit trust. 2. Using insurance plan to build wealth instead of pure investment products. Very well written. However, I would like to draw your attention to investing in high return investment. 4 years ago, I withdraw my EPF and invested in a high return 5-year period investment; the brochure said at least 15% return per year. So 5 x 15% = 75% return. Now after 4 years , the return average out to be about 2.5%! Good example. When an investment is not within your control, it is quite difficult to see high return. Hi KC! I am an entrepreneur as in I sell insurance. When you say investment within our control does it mean to invest in our education first so that we can perform better and acquire more income? In your case, find education/mentor that can boost your income. You are the goose that lay eggs. Imagine training yourself to lay bigger eggs! And you will have bigger income your entire life. Thanks KC for the advice. I never realised that investing in myself is a very valuable investment that I’ll ever make. Thank god its not too late for me to make improvements to myself. Yeap .. investing in yourself pays the best dividend.